Suppose a diving board with no one on it bounces up and down in a simple harmonic motion with a frequency of 4.00 Hz. The board has an effective mass of 10.0 kg. 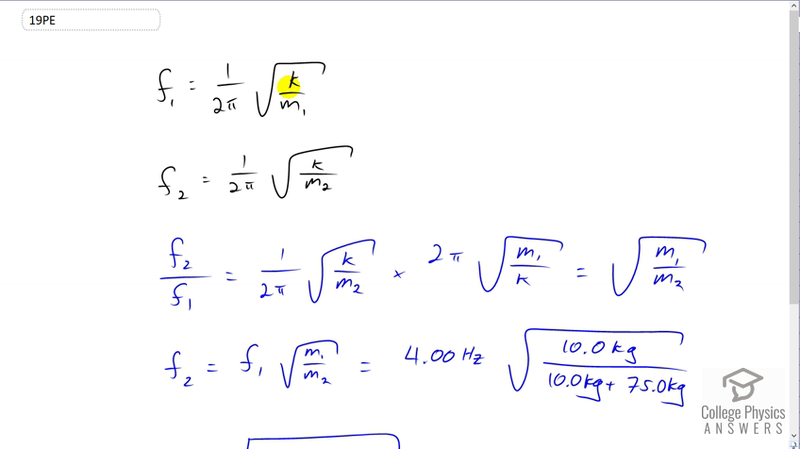 What is the frequency of the simple harmonic motion of a 75.0-kg diver on the board? This is College Physics Answers with Shaun Dychko. The frequency of oscillation of the diving board on its own is f1 and it's going to be one over two Pi times the square root of the spring constant, divided by the diving board's mass m1. And then, when a person goes on the diving board we'll call that new frequency f2 and that equals one over two Pi times the same spring constant because it's the same diving board but divided by different mass, the mass of diving board plus the mass of the person that goes on the diving board. Now, f2 divided by f1 is going to be f2 one over two Pi times square root k over m2, multiplied by the reciprocal of f1. I like to multiply by the reciprocals instead of dividing by fractions. So, multiplying by two Pi times square root m1 over k. So each of the factors here was flipped. And this equals, square root m1 over m2, because the two k is cancel and the square root k is cancel. So I should say, the two Pi is cancelled. And we have f2 over f1 is square root m1 over m2. And then multiply both sides by f1, and you get frequency two is frequency one times square root m1 over m2. So that's four Hertz of frequency originally of the diving board on its own times square root of mass of the diving board on its own at ten kilograms divided by m2 which is the diving board and the person's mass combined. And this works out to 1.37 Hertz.